1. Prepare the sweet pastry. In a large bowl mix flour with ground almonds, cocoa powder, sugar and salt. 2. Incorporate butter to the flour mixture, using a pastry blender, a fork or a pastry processor, until crumbs are formed. Add the egg and vanilla extract and mix them in. Add water and incorporate into the dough. Wrap it with plastic, knead slowly to form a disc and refrigerate for at least 30 minutes or overnight. 3. On o floured surface or over the plastic wrap roll the dough to a circle with about 1 1/2 inches larger than your tart pan. Lift up the rolled dough and place it on a greased 9 inch tart pan. Remove the edges and refrigerate for 30 minutes before baking. 4. Prick the dough with a fork, line a parchment paper over the dough. Fill with dry beans, rice or pie weights. 5. Bake for 15 minutes in preheated 350 F (180C) oven. Remove the weights and the parchment paper. Return to oven for another 10 to 15 minutes. Allow to cool before removing from the tart pan. 6. Prepare the caramel. Place the sugar and water in a medium heavy bottomed saucepan over medium-high heat, and cook without stirring until sugar dissolves and gets a caramel color. 7. Remove the pan from the heat and add the cream. It will bubble a little bit. 8. Cook for about 1 or 2 minutes stirring constantly with a wooden spoon until smooth. Remove from heat and add butter and salt. Stir well until smooth. 9. 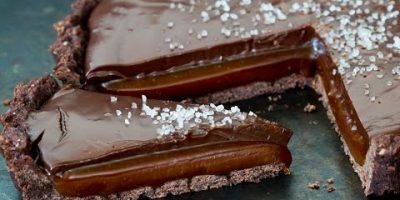 Let the caramel cool slightly and pour over the chocolate crust. Refrigerate for about 4-5 hours. 10. Prepare the chocolate ganache. Heat the cream in a small saucepan. When the cream just begins to boil at the edges, remove from heat and pour over the chopped chocolate. Let sit one minute, then stir until smooth. 11. Pour the chocolate ganache over the caramel. Spread it evenly and refrigerate for another 2-3 hours before serving. Sprinkle with sea salt flakes and serve.